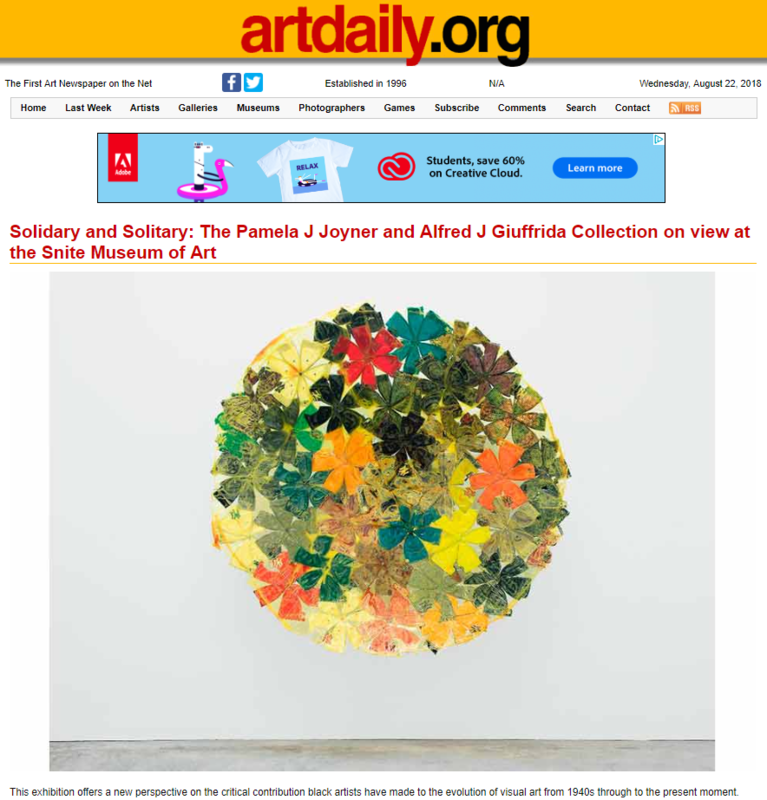 NOTRE DAME, IND.- The Snite Museum of Art is showing the major nationwide touring exhibition Solidary and Solitary: The Pamela J Joyner and Alfred J Giuffrida Collection. This exhibition offers a new perspective on the critical contribution black artists have made to the evolution of visual art from 1940s through to the present moment. Curated by noted art historians Christopher Bedford and Katy Siegel, this is the first large-scale public exhibition to bring together a vital lineage of visionary black artists. Commencing in the mid-twentieth century with Abstract Expressionist Norman Lewis, the show traces a line through some of the most celebrated artists working. Drawing on the Joyner/Giuffrida collection’s unparalleled holdings, a central theme is the power of abstract art as a profound political choice, rather than a stylistic preference, for generations of black artists. The exhibition demonstrates how abstraction has declared individual freedom; a resistance to the imagery of racist mainstream culture on the one hand, and pressures to create positive representations of black Americans on the other. Ranging across 70 years, Solidary and Solitary reveals a rich and complex history woven from the threads of artistic debates about how to embody blackness; social struggle and change; migrations and the international African diaspora. Placing a spotlight on individuals’ pursuit of creative freedom in different eras and geographical contexts, highlights include works by an array of artists that fuse the social and the abstract in visceral ways, including Sam Gilliam, Norman Lewis, and Kevin Beasley, among many others. Placing a spotlight on individuals’ pursuit of creative freedom in different eras and geographical contexts. Solidary & Solitary: The Joyner / Giuffrida Collection is presented by The Helis Foundation and organized by the Ogden Museum of Southern Art and The Baltimore Museum of Art. Free and open to the public. Light lunch and refreshments will be served. With art, music and balmy weather, “Evenings with Enrique” might be the perfect way to wrap up a beautiful spring day. Advancing access to the arts in New Orleans. A family legacy of philanthropic support to the New Orleans community. The Helis Foundation is a Louisiana private foundation, established and funded by the William Helis Family. All photos ©Crista Rock unless otherwise noted. © 2019 The Helis Foundation.